Note: The medium of the work is actually colored inks on vellum, also called parchment. Regensburg, Germany is situated at the northernmost point of the Danube in Bavaria; it was a Roman legionary headquarters from 179 ce, the seat of a bishopric from 739, an imperial free city from 1245, the seat of the imperial parliament from 1663 to 1806, and under the Bavarian crown from 1810 to 1918. Under Bishop Baturich (817-48) the city was already a distinguished centre of learning, and the earliest datable example of neumatic notation, the "alleluia prosula Psalle modulamina" (notated by the clerk Engyldeo), together with other examples, was made in Regensburg during his time. The "Regensburg Gradual" D-Bs Lit.6 probably dates from the time of Bishop Wolfgang (972-94), and several chant books (the tropers Mbs clm 14083 and 14322 are particularly important) survive from the first half of the 11th century, part of which time the city was an imperial residence. Several figures of music-historical importance were monks at the Benedictine monastery of St Emmeram: Arnold, composer of the proper office of St Emmeram (c1030); Otloh, composer and music theorist, involved in the composition of a proper office for St Dionysius (c1049); and Wilhelm (d 1091), music theorist and later abbot of Hirsau. Hermannus Contractus of the Reichenau composed the proper office for the Regensburg canonization of St Wolfgang in 1052. 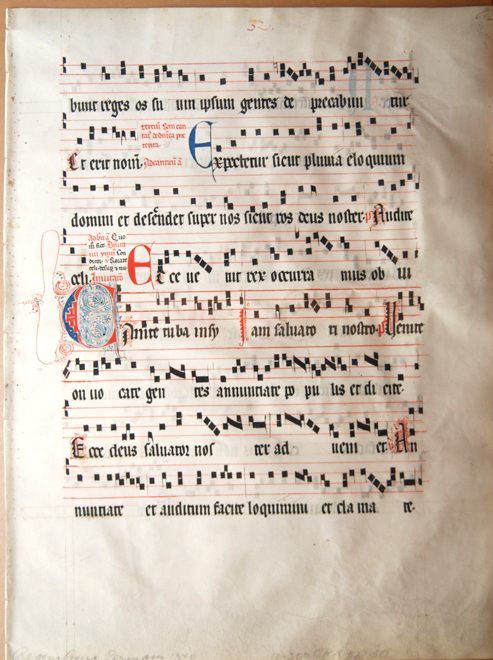 Chant books also survive from the Benedictine monasteries of Prül and Prüfening on the outskirts of Regensburg, and from the city's Dominican friary and convent. A proper office was composed for another patron saint of the city, Erhard, by Konrad of Megenberg in about 1365, soon after the date of the present page.